Yessssssss... I was back to stealing... only this time I picked flowers from Cindy's garden... These paintings are via photos taken by Cindy of Quaint Handmade. She took sooooo many wonderful photos... it was a garden of earthly delights! 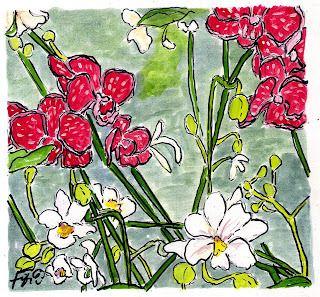 If you like these paintings... you can *WIN a set of 8 frameable notecards (2) of each flower... BUT YOU CANNOT win them on my blog alone... YOU MUST visit Quaint Handmade and see the ORIGINAL photos and LEAVE HER A COMMENT... BUT don't forget to say hello to moi before you leave... it may increase your chances of winning! Deadline is March 15th... Winner Announced March 16th!!! I almost forgot... ORIGINAL paintings are AVAILABLE at 60% off... EMAIL ME for details! To see more Fifi Flowers art for sale visit MY ETSY STORE!!! *This GIVEAWAY is part of "The Secrets in the Sauce Spring Fling"
Tomorrow is Outdoor Wednesday... and do I have a fun day wrap up planned... stop by! Oh my, you have been very busy creating the loveliness that is your work! I just adore all of your art I have collected over the years and they look just grand in my sun room which is just such a happy place for me! I start each day there. My only wish is that the sun would never move as many have commented at how lovely I look in the soft morning glow that illuminates it each wondrous morning. It's very rude of the sun to carry on it's journey. It's very difficult for a girl to find her best lighting! Don't you think so, too, Fifi? I do hope that many are collecting your works of art, Fifi, as I have found them to be astonishingly fabulous little smiles that are forever captured and framed on my wall. Petunia who is a great collector of all that is great! 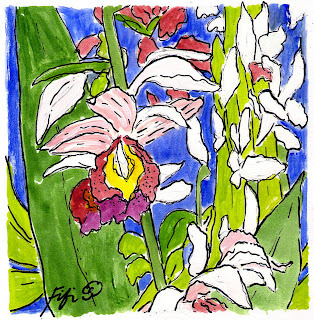 Love that last orchid painting...you are so prolific! And have a great eye :) Have a great week Fifi! Bursts of spring color right here! How's my favorite artiste doing?? Such wonderful new things - love it!! I am terribly jealous of your talent. I'm off to Quaint Handmade. For anyone who hasn't had the pleasure of owning a "Fifi" can I just say from experience....AWESOME! And even more beautiful in person. Oh and Fifi...I finally found some fitting frames for my bicycle note cards. When I get them hung up I'll post a picture. I just don't have the heart to actually use them as note cards! I'm kicking myself for not getting the same frame for the chair cards that are on their way to my house. I'm such a dork. I'm off to check out the originals! These paintings are beautiful, Fifi. I'd love to win the cards! These are great - I LOVE your style!! I love the second one... so lovely! You have a wonderful blog. I am visiting via Sits. I hope you will stop by and enter my giveaway too. Those are so, so pretty!!! You are very talented and I would love to have a little Fifi in my apt! So you are up to your old tricks...stealing again. Beautiful pictures. Oh Fifi, these flowers paintings are one of my favorites! Gorgeous! awwww....Fifi~you do flowers like NO other! and the colour, such BEAUTY!!! Amazing - you picked the perfect photographs to paint! Both your styles combined are stunning! Pretty, I love your artwork! These are all simply breathtaking! And so in tune with spring - Very Lovely Fifi! That is a great giveaway!! I love those pictures. I already went over and said HI! Hello Fifi. Love your work! And I think helping Belette find Lily was very noble of you. My first time here, and I love it! Beautiful pictures! You're a wonderful artist. Everything you do is just beautifully refreshing!! Love it! Christina - xristya@rock.com - Hello Fifi! You have such style and verve and love what is beautiful in life! I left a comment on the other site about your drawings, and you can go there and see what I said! I think this flower painting fit for our new decorated living room, will give to my mom as her gift.